I thought I would share two solid points offers today. 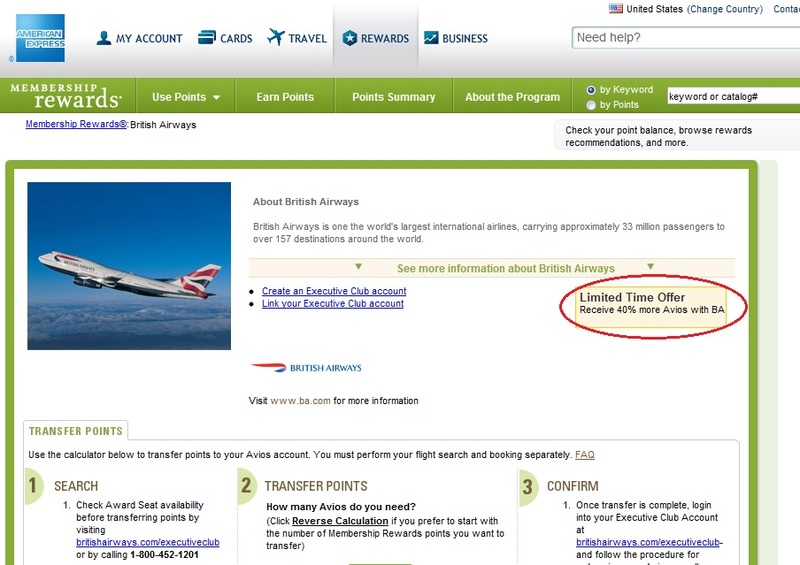 American Express is offering a 40% bonus on all Membership Rewards points transferred to British Airways. This offer expires on September 27th. Membership Rewards points are fantastic due to their flexibility and lucrative transfer bonus promotions such as this one. 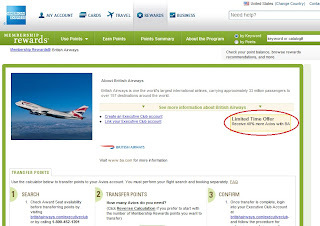 Transfers are usually instantaneous, so you can search for an award ticket and then transfer the points into your British Airways account. I took advantage of a similar bonus promotion last year and am actively looking for a great European trip using the British Airways miles. Though Membership Rewards lost some important transfer partners in the last year (including Continental/United and Southwest Airlines), they still have some great partners such as Delta Airlines, All Nippon Airways, and British Airways. Membership Rewards points are most valuable when transferred to airline miles, so avoid turning them in for a toaster or television (where you receive less than one cent/point in value). Another bonus promotion to kick the tires on comes from Alaska Airlines. 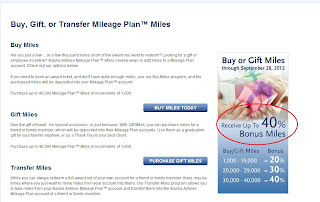 They are offering an escalating bonus on purchased miles, depending on how many you buy. Purchasing between 30,000-40,000 miles yields a 40% bonus. Alaska miles are some of the most valuable out there. They have a GREAT route network to Hawaii via the West Coast, and they also partner with Delta, American Airlines, and Cathay Pacific Airlines, among others. If you don't believe how versatile their miles can be, check out their partners as well as their partner award chart. With that being said, you should probably only take advantage of this offer if you have a specific award goal in mind. Buying miles from an airline or hotel outright, even with a special promotion, is usually an unfavorable proposition. If you have that dream trip in mind or need to top your account off to get to higher award level, then buying miles absolutely makes sense. Keep those emails coming, everyone. Until tomorrow!